three-fourths of an acre of land from Mrs. Harriet Jones, who conveyed and deeded to deacons Hardy Davis, Joseph Ware, and their successors in office, the tract of land on which the church was built. During the one hundred and forty-three years of its soul-winning and kingdom-building career, the Flatrock Baptist Church has enjoyed the leadership of many pastors, among whom were Rev. Jim Wilson, founder; Rev. Charlie Foster, Rev. Horton, Rev. Nichols, Rev. J.W. Howard, Rev. J.D. Shockley, Rev. W.H. Ferrell, Rev. W.H. Till, Rev. S.M. Davie, Rev. J.L. Dorsey, Rev. R.C. Gise, Rev. W.E. Newman, Rev. O.M. Collins, Rev. A.W. Motley, Rev. Dwight Cook, Rev. Bradley Bell, Rev. William D. Harvey, and Rev. Dr. Scott McClure. Reverend O.M. 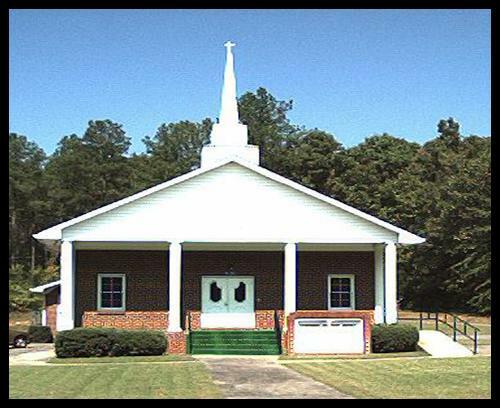 Collins became the pastor of the Flatrock Baptist Church in October of 1957, and immediately made plans for the improvement of the church building. The improvement began in 1963 and was completed in 1968. This improvement included the enlargement of the choir loft, the building of the pastor’s study and choir room, hardwood floors, paneled walls, pews, and pulpit furniture, carpet, and the colonnaded porch and steeple. Along with the physical improvements, many souls were added to the church membership and the Sunday School was reorganized with the addition of two more classes for children and young people. The Missionary Society was also reactivated, and a Youth Choir was organized. On August 26, 1979, Flatrock called as pastor, the Reverend A.W. Motley, who served for one year. acquired, and the sanctuary, choir room, and pastor’s study were air conditioned. Also, pews and pulpit furniture were upholstered with red velour foam coverings, and the Junior Usher Board was organized. After the resignation of Reverend Dwight Cook, Flatrock called as pastor the Reverend Bradley Bell from Atlanta, GA. Rev. Bell began his ministry at Flatrock on July 19, 1987. Reverend Bell was an inspiring preacher of the gospel. His leadership was based upon prayerful seeking of the will of God in his life. Along with the physical improvements of the church both inside and outside, 25 new members were added to the church, the re-organization of the Nurses Guild, a children’s choir was organized, there was a revival of Wednesday night Bible Study, a tape ministry wasbegun as well as Vacation Bible School, and a Young Adult Usher Board was organized. On October 18, 1992, Flatrock called as its pastor the Reverend William D. Harvey from Ellenwood, Georgia. Under Reverend Harvey’s leadership, the front yard was graded and paved, two deacons were ordained, two new members were added, and a Pastor’s Aides Club was organized. Reverend Harvey’s wish for us was that we would continue to blend together with a fervent spirit so that we would reach our highest expectations. Rev. Harvey submitted his resignation on February 25, 1996. Dr. K. Scott McClure was issued the call to serve as pastor of Flatrock on January 1, 1997. Under the leadership and guidance of Dr. McClure, we have purchased a church van, computers, printers, new piano, new copiers, new carpet, started the Marriage Enrichment Ministry, Deaconess Ministry, Van Ministry, Children's Church, Intercessory Prayer Group, Angels Building Fund Ministry, Pastoral Care Ministry, Youth Dance/Praise Team, Outreach Ministry, Structured Bible Study, Extended Sunday School Classes, Newsletter, Constitution and Bylaws, added 60 new members, ordained three Deacons, on April 25, 2003 our Church was officially incorporated to be recognized as Flatrock Baptist Church of Rome, Inc., and in 2006 added a church website known as www.flatrockbaptistrome.com. Our church has grown both spiritually and physically. Dr. McClure is a great teacher, leader, and role model. We pray the grace of the Lord will be with Dr. McClure as he strives to enhance our spiritual growth, through the guidance and leadership of the spirit of God.